Wii keep telling U. There is a Wii-U & Vita version of this game. If our early reports on this didn’t convince you, or the trailer which was on Sonic Wrecks… Well Sega themselves have finally confirmed it. There is to be a Vita & Wii-U version of this game. 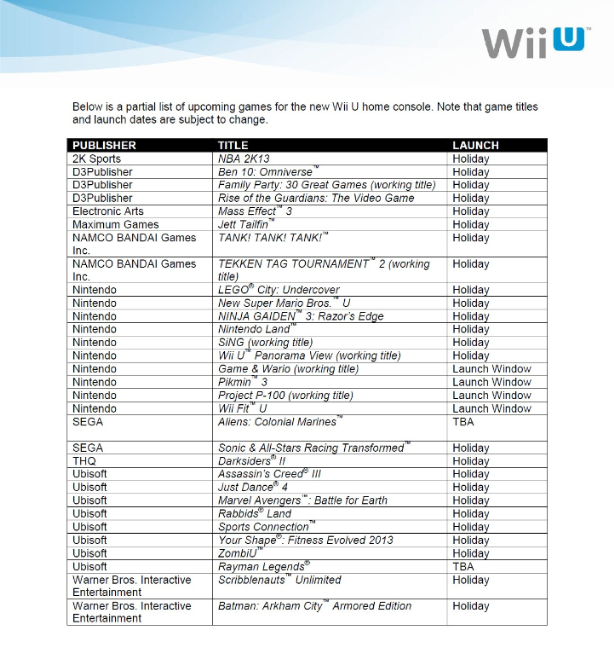 Following Nintendo’s E3 conference, an official document has been doing the rounds which shows several games for the Wii-U including Sonic & All-Stars Racing Transformed. However, following the announcement of Danica Patrick in the game, Sega have issued a Press Release which outlines plans to release the game on Wii-U and Vita later this year. SEGA is aiming for a November 2012 release for Sonic & All-Stars Racing Transformed. We can also reveal with certainty that the SUMO Digital-developed racer will be heading to Nintendo’s Wii U, with versions for PC, iOS and Android also in the works. Transformed will feature 16 tracks to race on, with scope for more down the line – the game will definitely see some form of DLC, if things go according to plan. For those attending the San Diego Comic Con, expect a new character reveal too. SEGA and SUMO are also planning some “unique platform specific features” for the Wii U, 3DS and Vita versions of the game – we’d assume this will boil down to alternative control methods using the various inputs of each platform, but we’d welcome something more dramatic. The details were announced at the Las Vegas Licensing Expo 2012 (in Las Vegas, obviously), where SEGA appeared to make a big push to sell the Sonic brand to various marketing and licensing partners. Details on the history of the Sonic video game franchise – as well as details on SART – were revealed in a press pack handed to attendees. This has been a surprisingly awesome sweet sixteen birthday week for NiGHTS into Dreams and its fans. Mere days after a digital HD release of the classic Saturn title was revealed, we now have confirmation right out of Summer of Sonic that NiGHTS will be appearing in the upcoming SEGA crossover racer Sonic & All-Stars Racing Transformed. NiGHTS and his rival Reala will both feature as vehicles in the game. In the original games, NiGHTS could transform into different vehicles and creatures to better suit certain environments. All-Stars cleverly references this mechanic by allowing NiGHTS and Reala to change into all new vehicle forms. NiGHTS is driven by the childlike Nightopian creatures, while Reala will be driven by the Goodle riding nightmaren from Journey of Dreams. The character designs are based off of Journey of Dreams. Despite the character designs being based off of Journey of Dreams, the stage is derived from three areas from the first game: Spring Valley, Gillwing’s Lair and Wizeman’s boss arena. Going by the footage, these areas are going to look gorgeous and I can’t wait to play them. If the level is present in the Comic Con demo, we’ll be sure to get you some details and footage of it next week. Until then, you can catch the footage shown at Summer of Sonic here. The Sumo Digital Q&A starts at 27:30 while the footage can be found at 1:17:40. Keep in mind the footage is work in progress. É bem vindo, mas nunca consegui gostar de nada que a Sumo Digital tenha feito, por isso está completamente fora da minha lista de compras eventuais. A new trailer for Sonic & All-Stars Racing Transformed has surfaced during Comic-Con and, while it doesn’t provide any new details on tracks or characters, it gives us a date as to when we can get our hands on the game! Set your calendars for 16th November 2012 if you’re in Europe or 20th November if you’re in North America and get ready to race! The box art for the game has also been unveiled! Take a look right after the jump. Amazon.com and .co.uk have today updated their listings for Sonic & All-Stars Racing Transformed with a full product description that reveals a ‘World Tour’ mode. This is likely what previews have been referring to as ‘Story’ mode and will be how players unlock new content, much like ‘Planet Superstars’ mode in SEGA Superstars Tennis. Amazon.com has also updated all versions of the game to a ‘Bonus Edition’, though, unfortunately, they don’t explain what this edition of the game includes. We’ll keep an eye out for an update. It’s not just your fellow racers you need to watch out for, as the road falls away beneath you, or the river runs dry, new routes emerge and your vehicle transforms to take advantage of the terrain. Discover alternative routes and short cuts as you perfect the course in this adrenaline fuelled dash to the finish line – racing will never be the same again. Dynamic Tricks: Take to land, sea & air as you race through 16 dynamically changing courses inspired by SEGA’s illustrious gaming history. Discover alternate routes, find new power-ups and avoid emerging hazards as you race to victory – every track feels different. Ultimate Gaming Experience: Old rivalries can be settled and new ones created in up to 8 player online. Journey through the All-Stars’ world to take on a huge range of modes and challenges, including Grand Prix, Battle arenas and an incredible world tour. * Transform into a Car: Boost and drift your way around the track. * Transform into a Boat: Tackle dynamic rapids and huge waves to beat rivals. * Transform into a Plane: Take to the skies to barrel roll and dogfight to victory." There’s more Sonic All-Stars new racing your way today as IGN reveals a hands-on preview with the Wii-U version. The Wii-U version will include the ability to play the game on the game pad only sans TV or can be used to include a hub to keep the main screen clear. When you’re in a race, jockeying for position, the screen displays a range of pertinent information – the current order of racers, a mini-map of the course. It’s all unintrusive and useful, but I expect most people to keep their eyes firmly on the race. Similarly, when you unleash one of the game’s eccentric power-ups, you’ll be able to see its destiny on the GamePad’s screen. Launch a remote-controlled car loaded with a stick of dynamite and you can watch it travel towards its unfortunate target. Also mentioned is one of the games arena modes that use the Wii-U game pad to it’s advantage. Depending on the circumstances, a GamePad can prove to be an advantage or disadvantage, and All-Stars Racing Transformed smartly uses this discrepancy as the basis for its mini-games. I only saw one during my time with the Wii U version, called ‘Super Monkey Ball Arena’, and whomever had the GamePad took control of AiAi, who was as usual encased in his perspex sphere. Meanwhile, opponents using Classic Controllers played as Sonic and Tails in racing cars. The aim of the mini-game was simple: before the time ran out, squash the tiny versions of Sonic and Tails, who were driving around attempting to collect as many bananas as possible. The Wii-U version of the game is shaping up to be very unique from the other consoles. Perhaps unsurprisingly, Sonic will be joining the likes of Mario and Rayman in the launch line-up for Nintendo’s upcoming Wii U console in the UK, as SEGA has revealed that Sonic & All-Stars Racing Transformed is set to be released on 30th November. - each of those modes will have a ranking system. Ever since it was revealed behind closed doors at GDC, the Wii U version of Sonic & All-Stars Racing Transformed has received criticism from numerous sources for its poor frame rate and graphical issues. If Steve Lycett’s comments on Sonic Talk a week ago weren’t enough to allay your concerns, and going by some of the comments I’ve been reading around the internet it clearly hasn’t, here he is again addressing the graphical concerns on the SEGA forums. For those of you who haven’t listened to Sonic Talk, Lycett’s explanation for the poor performance of the Wii U version was the simple fact that the demo the critics were playing at GDC was based on old code. Since then, more previews have come out complaining about the frame rate issues, but that’s probably because it’s the same exact demo. SEGA will typically use the same demo across multiple events, as it takes time to make a new one, and according to Lycett on Sonic Talk that was time the team simply did not have. Começo a achar que sou dos poucos interessados neste jogo, parece-me bastante divertido. Daqui quem sexta-feira vai comprar este jogo?